Community hero and actress Keshia Knight Pulliam kicked off Allstate’s National “Give Back Day” in honor of Martin Luther King, Jr.
For the fifth consecutive year, Allstate Insurance Company is honoring the legacy of Dr. Martin Luther King, Jr., through Allstate Give Back Day, a national program that encourages individuals across the country to volunteer. Recently, I had the pleasure of speaking with Ms. Margaret Dixon, one of the 2013 Allstate Give Back Day Heroes from Oakland, CA. Dixon, along with Jackie Lomax from Chicago, Joseph Cole from Nashville and Freedom Wright from Atlanta are remarkable heroes that help to create positive, sustainable change in their communities. As part of their recognition, the heroes attended The King Center’s “Salute to Greatness” Awards in Atlanta on January 19, 2013, and participated in a volunteer activity in their hometown over the MLK holiday weekend. In addition, Allstate will be making a $2,500 donation on behalf of Ms. Dixon to the charity of her choice. Ms. Dixon, the first recipient from California, is a retired Oakland police officer who served 25 years in the city where she was born and raised. 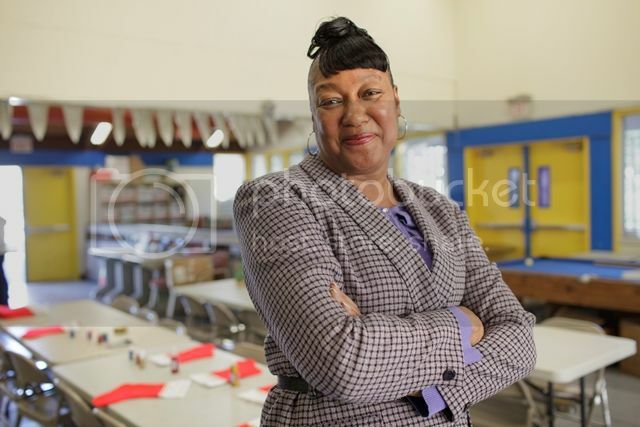 She is currently an instructor of the Administration of Justice Program at Merritt College, and serves as the board president of the Oakland Police Activities League (PAL), a nonprofit that serves at-risk boys and girls in Oakland by providing afterschool activities and sports opportunities. Dixon spends countless hours volunteering to create positive and safe programs for Oakland’s youth. She has served as head coach of the Oakland PAL track team, which she also founded. The PAL track team has allowed hundreds of Oakland youth to travel beyond the city limits, a first-time experience for many kids in her program. She has guided several of her athletes to receive college athletic scholarships. How does it feel to be honored as one of the Allstate Give Back Day Heroes? I am honored to be named as a hero for my commitment to volunteer in my community. I do so much from the heart, so it is an honor to receive this award. I try to make every day meaningful by making a positive impact. I love inspiring people to do positive things. I am also thankful that this award comes with a monetary donation that I will use to support our organization’s programs and upcoming events. Who inspires you to do the work that you do for the community? My mother, who was a single mother, taught my sisters and me to always do the right thing and give to others in spite of how little or much we had. I had great middle and high school teachers that inspired me. I had great co-workers as a police officer that supported and worked alongside me with my work in the community. 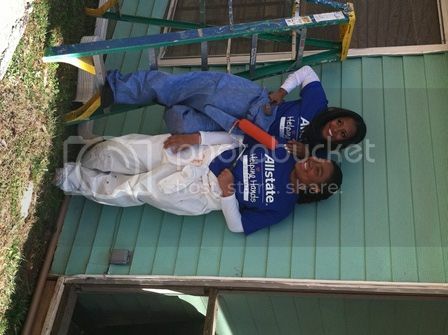 In photo: Keshia Knight Pulliam (the Allstate Give Back Day celebrity ambassador) and Freedom Wright, the Allstate Give Back Day Hero from Atlanta, participating in home repairs for a senior citizen in need in Atlanta. This Allstate Give Back Day activity was in partnership with HouseProud in Atlanta. Who are some of your heroes in the Oakland area? The Warriors Foundation does so much to support Oakland youth by giving tickets for them to attend games, and adopting over 100 families during the holidays. The Lucky’s Foundation always gives us food for families during the holidays. Oakland Police Chief Howard Jordan, how in spite of his extremely busy schedule, makes time to speak to youth to encourage them and provides me with the support I need to continue to do my work in the community. Mr. Larry Reid, Oakland City Councilman for District 7, who volunteers his time and other resources to support my work. Also, the local Bingo Halls support our work with youth as well. What is one of your most memorable experiences with your work at PAL? A young man who has now graduated from Portland State, who I have known since he was four years old and was being raised by his grandmother. When I met him, he was afraid of the police based on the negative experiences his family had. The proudest moment was being there with him, his family and his football coach when he signed his football scholarship papers. His story and the stories of other youth I work with is how I know that volunteering works. All it took for me was to be in his life and give him guidance. This young man is giving back in Portland and is encouraging others to give back as well. Are there any words of wisdom that you want to share with our readers? On the Martin Luther King Holiday as well as throughout the year, find somewhere to volunteer to give back to your community. Visit the website www.allstate.com/GiveBackDay to find volunteer opportunities in your area.